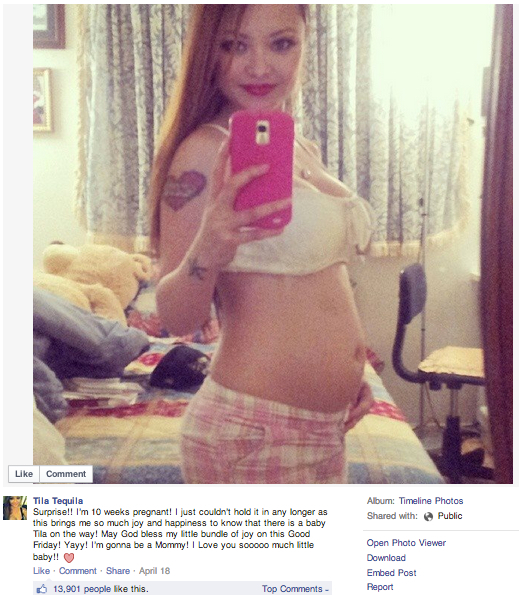 Nearly two and a half years after declaring her intention to convert to Judaism before abandoning the tribe for Nazi-themed photo shoots, and proclamations about “dirty kikes” and their “Synagogue of Satan,” Tila Tequila last week announced on Facebook that she’s ten weeks pregnant. So hey, Tila – On behalf of all of us here at Heeb we want to wish you and incoming baby Tequila a hearty “Mazal Tov”! And, in thirteen years, when this kid goes through his or her inevitable Alex P. Keaton-esque form of rebellion and actually converts to Judaism, we’ll make sure the social hall here at the Synagogue of Satan (new doom metal band, anyone?) is ready for the Bar Mitzvah party.